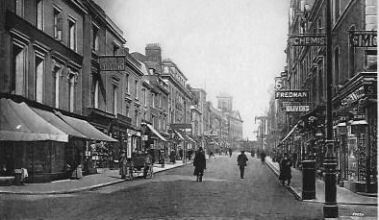 Fore Street looking east from the corner of Tavistock Street. Tozer's and Shannon's are first on the left and Broom, the chemist, and Oliver's on the right. In the distance is the tower of the Devonport Public Hall, by this time the Electric Cinema. The "foremost" street in Plymouth-Dock, is first recorded, although not by name, in a lease dated 1728 as a highway of 30 feet in width extending from the Dock Gate eastwards to Parson's Gate. It is not known if any highway existed here before the Royal Dockyard was built in 1691. It is shown on Benjamin Donn's plan of Plymouth-Dock in 1765 as the widest highway in the town and was accessed from Plymouth by either Mill Bridge or Deadlake Lane. 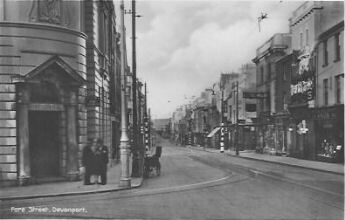 Fore Street looking west from Chapel Street, circa 1940. Note tram stop marked with white paint on tram poles. In 1914 numbers 1 to 59 Fore Street were on the southern side running from the barrier gate near Military Road to the Dockyard Gate. Numbers 60 to 119 Fore Street were on the northern side from the Dockyard Gate back to the barrier gate. Principal buildings in Fore Street were the Hope Baptist Chapel (between numbers 1 and 2); the Wesleyan Sailors' and Soldiers' Home (2); the Tivoli Electric Theatre (between 8 and 9); the Capital and Counties Bank (10); Devonport Post Office (on the corner with Chapel Street); the National Provincial Bank of England (24); Lloyds Bank (30/31); the Royal Sailors' Rest and Institute (55 to 59, opposite the Dockyard Gate); Barclay's Bank (73); the Royal Hotel (between 76 and 81); the Western Daily Mercury office (90); the Naval Bank (98); the Devonport Public Hall and Electric Theatre, including the Young Men's Christian Association (118). The Licensed Landmarks in Fore Street in 1914 were the London and South Western Railway Tavern (number 1); the Railway Hotel (5); the New London Inn (71); the Devonport Spirit Vaults (74); the Royal Hotel (between 76 and 81); the Two Trees (88); the Golden Lion (91); the Lifeboat Tavern (105); and the Military Arms (number 116). Fore Street was the terminus of the Plymouth, Stonehouse and Devonport Tramway route and the Devonport and District Tramway Company's routes to the Borough boundary at Pennycomequick and Tor Lane. looking west from Chapel Street, circa 1939. Note brand new Forum Cinema on right. 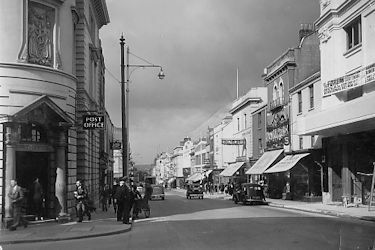 Until the Second World War Fore Street was the shopping centre of Devonport but it paid the ultimate price for being at the centre of a naval and military town by being almost totally destroyed by bombing in 1941. 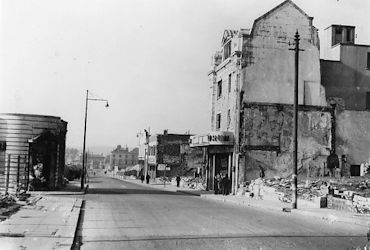 Only a few buildings were left standing and remained in use in post-war Devonport: the London & South Western Railway Hotel (number 1); the Devonport Methodist Central Hall; Barclay's Bank Ltd (73); the Midland Bank Ltd (99); Marks & Spencer Ltd (100-102); and the Forum Cinema (111/2). Many of Major Peter Nissen's Huts were erected on the northern side of the Street, one of which became the Welcombe Club and Canteen. Another sunny day in Fore Street, Devonport, but what a difference. The rump of the General Post Office is on the left and the virtually undamaged Forum Cinema is on the right. Compare this picture with the one immediately above it. Fore Street after the Blitz looking from the Royal Dockyard end. Courtesy of Devon Library Services. 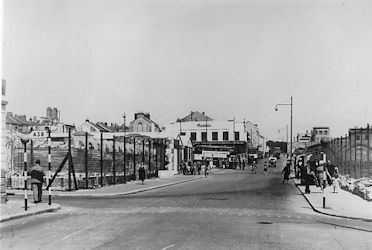 As from Monday June 1st 1959 Fore Street was closed to all road traffic and buses on Plymouth Joint Services' routes 6 and 27, both to and from Saint Budeaux, were diverted from Chapel Street to the new Granby Way. Fore Street was then taken inside the new extension of the Royal Dockyard. This included the buildings previously occupied by Barclay's Bank, the Midland Bank, Burton's and Marks & Spencer's.